We have been ALL ABOUT sharks this week, anybody else? We've been watching and learning a TON and so I thought it would be fitting to do a couple of little shark activities. 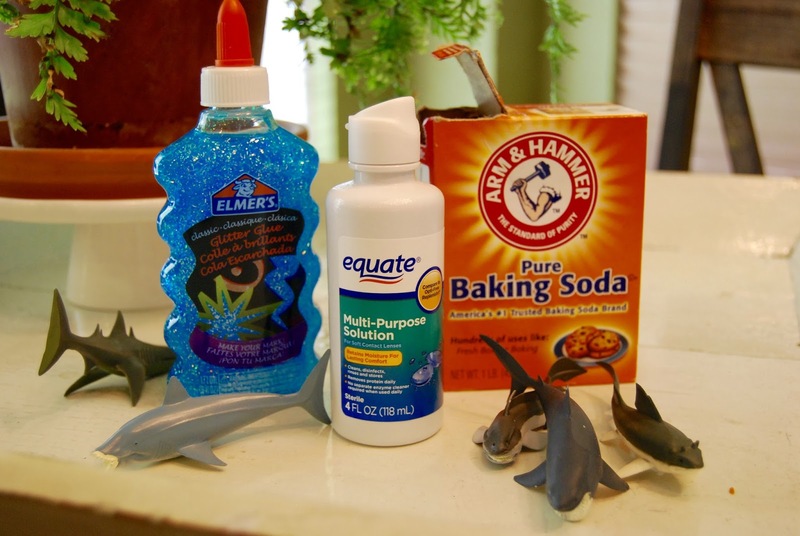 The boys have been begging me to make slime and so when I saw this shark slime recipe HERE I knew it was finally time to bite the bullet and make some slime! All we did was pour 1 bottle of Elmer's blue glitter glue into a bowl, then sprinkle 1/2 teaspoon baking soda on top and mix that together with a spoon. Then I poured in 1 1/2 tablespoons of contact solution and the kids kneaded it until it was slime! So so so easy! I picked up a package of sharks at Michael's when I was grabbing the glue (which is actually cheaper on Amazon) and they had a blast playing sharks in the slime. We also made newspaper sharks out of supplies that we had on hand. First the kids painted some white cardstock to look like water and we set it out in the sun to dry. Next we cut shark shapes out of newspaper, mouths out of black card stock and teeth out of white card stock. Then we cut their "ocean paper" into waves and glued everything all together. Luke was "too busy" to finish his, but I have two super fun sharks up on our fridge as a shark week memento. So CUTE! My 9 year old has been making slime all summer! Those sharks are super cute!!! 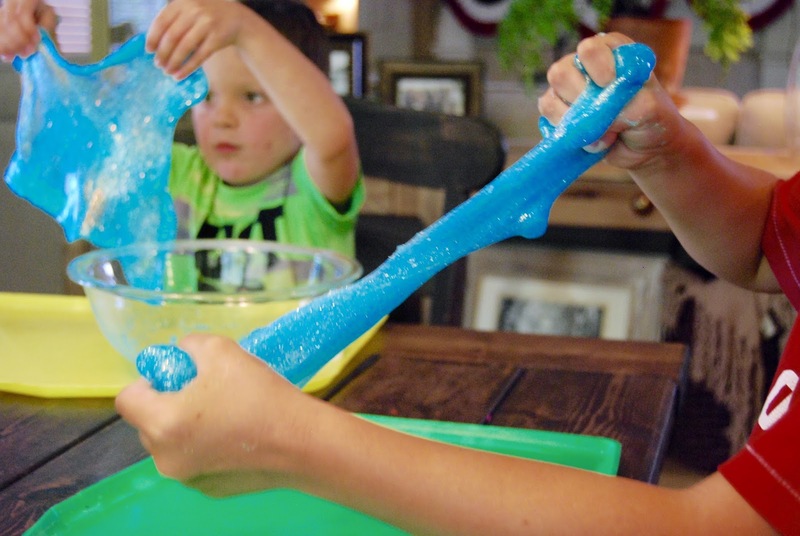 I'm glad to see your slime recipe doesn't include Borax. 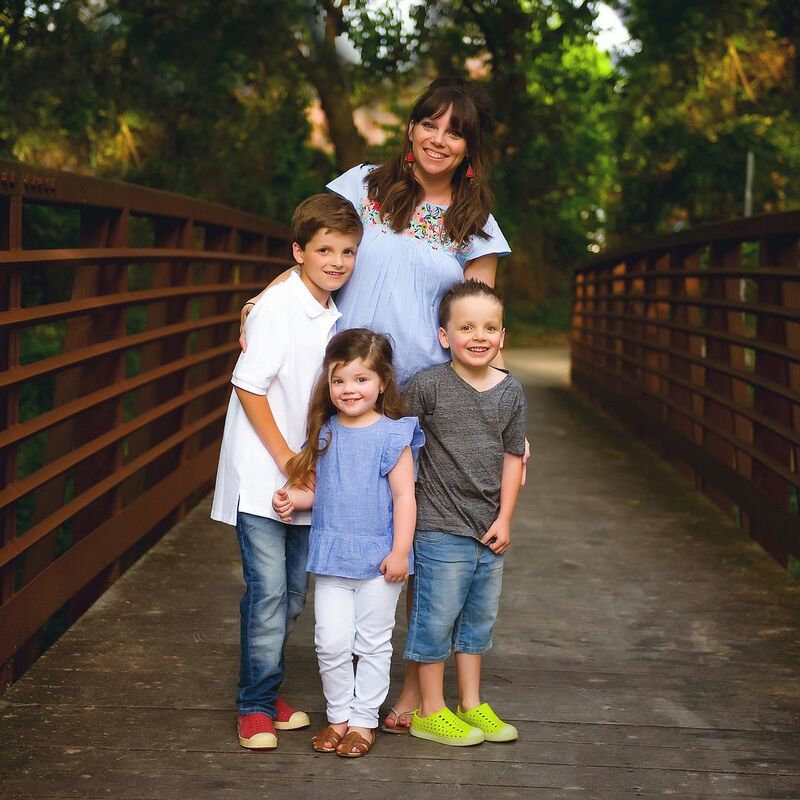 As a middle school teacher, we found that many of our students began to have some health issues once they started to play wth the homemade slime. We shared an article with the patents about the dangers of some of the ingredients in the slime and wondered if some ingredients could be the culprit. Obviously we can't be sure, but some of those ingredients have powerful chemicals! We love Shark Week here! We had seafood the first night it was on, have been reading all of our shark books, making Lego sharks, and we even made shark teeth snacks (check out Pinterest). Shark Week is a fun time in our house. I'd heard that about Borax and loved that this recipe because everything was harmless! Love that you make shark week so much fun! Yessssssssss! It's all about Shark Week over here too! My 5 year old son is OBSESSED with sharks right now and loving shark week. Cute ideas!! I bet he'd LOVE the slime! Oh my goodness, the Dumb and Dumber hair! Bahahaha. After reading this we did slime last night too! Thanks for posting. Our local CVS only had one bottle of glitter glue left, so we did one recipe with that and the other with normal Elmer's school glue. The one with the glitter glue was VERY sticky.. it didn't work out very well for some reason. The normal glue worked out great. I'm not sure why there would be a difference, but there was a big one! Maybe my daughter just didn't knead it enough.. I'm not sure.